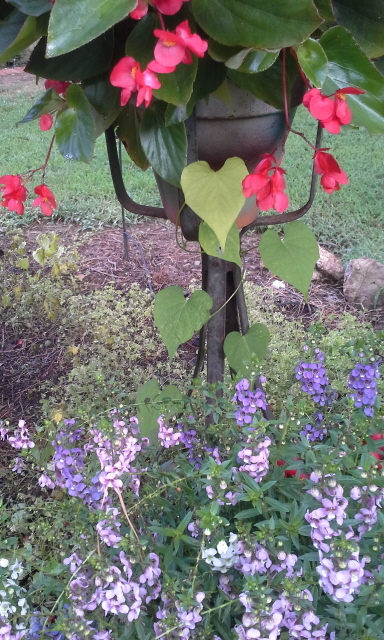 A lovely heart-shaped weed that doesn’t quite fit in. My grandmother gave me a Bible for my birthday in 1952. The inscription she wrote on the first page said, “May you grow in wisdom as you grow in stature.”—Well, I did a good quick job with the stature thing, but the other part was slow to develop and I’m still working on it. I grew tall quickly. I always stood out in a crowd of my peers, but I never quite felt like I fit in. I worried about fitting in for many years, but over time, as I worked on gardens, I found myself pulling weeds and saying, “You just don’t fit in here.” Every now and then, when I found a very nice weed, I would leave it and watch it—or, perhaps, I would dig it up and move it to a place that it seemed to belong in. Sometimes I would nurture the weed and care for it, but most of the time I just left it to its own devices because weeds are strong. Weeds are survivors. A lot of weeds are good-looking and smart. Do you ever feel like you don’t belong? Do you worry about what others say or think about you? Perhaps you need to re-think your position. Perhaps you need to concentrate on your own growth and your own place. That weed looks like a lovely morning glory. One of my favorite ‘weeds’.